When you were a young baseball player running the bases wasn’t much of a challenge, as catchers had weak arms, fielders rarely cleanly caught the ball and the fastest runners often just outran the ball. As you grew older the catchers became better, fielders normally caught the ball and only the faster runners on the team were allowed to attempt to steal a base. Welcome to Present Day base running…. 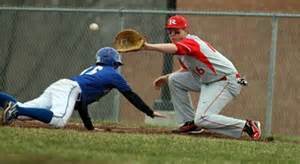 the advantage is now on the opposite end of the spectrum, the catcher, pitcher and infielders have the advantage, Speed alone will Not allow you to become a proficient base stealer or an aggressive base runner, as there is no more outrunning the throw. 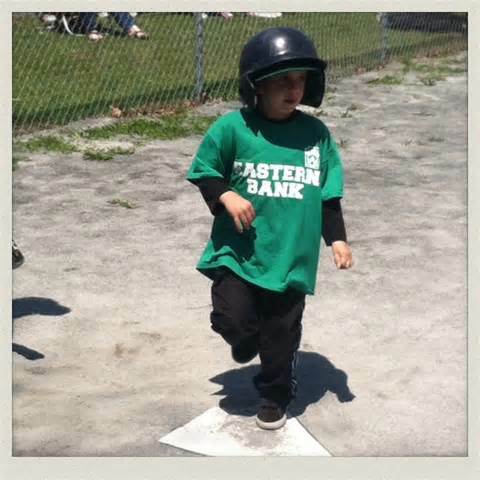 Learning to Run the Bases doesn’t seem to be a monumental task, we’ve been running since we were 18 months old, some earlier. However, as soon as we learned to walk we carried around Lincoln logs or other stick toy piece and hit objects, obviously that skill did not qualify us to hit a moving baseball. Therefore, we’re going to exam skills of Observation which will help you even the playing field, perhaps even tilt it in your direction, but you must know what to look for and that’s what we’ll detail. As soon as you arrive at the ball park and locate the field you’ll be playing on, your senses of sight, and believe it or not, hearing should become acutely aware. 1. Prior to beginning your warm-up tosses, carefully take a look around the entire field making a mental note of anything which could come into play that could affect the ball. Ask yourself a few questions as you look. A. Is there a wind today and if there is which direction is it blowing? A Strong wind to a particular field could cause a high fly ball to travel 10 feet or further than it normally would, but in the case of a strong wind blowing in towards the plate, it’ll hold the ball up longer and decrease distance of travel. B. Where’s the Sun located, which of course will change during the game, but you need to know what affects, if any the sun plays in the first inning, let the 5th inning take care of itself. Is it a High Sky, cloudy and overcast, etc. C. Specifically notice the texture of the playing field. Most ball parks have a dirt infield, but every now and then you’ll run across a grass infield. More importantly look at the outfield grass, is it thick or tall, as this will definitely have an impact on ground balls through the infield, such as you’ll have to automatically charge a ball if the grass is high. D. Observe the field layout including foul territories and corners. 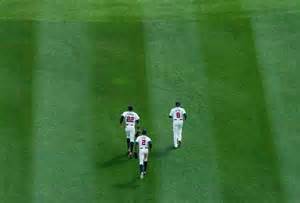 There may be a slight ditch 15’ outside the left field foul line, which would most likely be out of play, but if you’re running full speed chasing a foul ball fly in that area, you’ll need that subconscious note to pull up before the ditch. Or you may notice a weird angle at the right field pole area created by an awkward connection of fencing of the field and the parking lot. A ball could get trapped in that area if it bounced a certain way. These are a few examples of Observing the Field,but we’re not near finished yet. It‘s Important to observe your opponent closely during their warm-ups, a player with a rifle arm subconsciously will show it during warm-up tosses. This is not always the case, but it happens more often than not. A. Watch the outfielders as they take their fly ball warm-ups, as they will tell you a lot. Some players seem to be born to play the outfield, they glide across the field, while others seem to stomp their way through the grass. Observe if any of the outfielders appear to move to one direction better than another, as it’s not uncommon for players to move to their throwing side quicker, make a mental note if you spot this. B. This is when you can really analyze the arm strength of a player as he’s expected to quickly return the ball to the coach. Don’t only look at the strength of the arm, but notice accuracy and flight of the ball. If the baseball does not sink as the ball approaches the ball retriever, chances are they are not using a four seam grip, therefore the ball may sail or stay high, an opportunity to slide Under a tag. C. Watch the outfielders feet as he catches the ball. Is he moving forward as he catches the ball using forward momentum to help his throw, or does he catch the ball then take a couple of steps forward in order to gain momentum? D. Listen to what Command is given for a cut-off play. 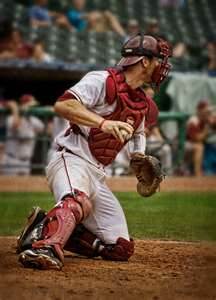 Some catchers will yell “Cut!” while others may yell “Second!”. As a rule the catcher will use the “Official” verbiage used in a game situation, and depending on the running situation, could tell you whether to try and advance or hang tight. There are 2 main players to constantly observe and that’s the pitcher and catcher, because they are in someway directly involved in every play, so you must know their strengths, to avoid challenging them, and their weaknesses, in order to capitalize on them. It’s imperative you watch everything about the catcher’s movements and habits because they will tell you something either about his physical abilities or his character of toughness. A.Does he stay behind the plate when throwing to second base or take a crow hop then throw? B. What type of footwork does he perform in order to get rid of the ball quickly? For that matter, does he get rid of the ball quickly? You may be forced to use a stop watch in order to accurately determine this value. Do you know the difference between a Good major league catcher and a Hall of Fame catcher is .2 of a second. The good catcher take 2.2 seconds to deliver the baseball from home plate to second base, a Hall of Fame catcher, 2.0 seconds. D. Judge his character. What I mean by this is, does he appear to be a good solid catcher who just tries to do the job, or is he a Risk Taker and will throw behind a runner at first or third? This will have a direct bearing on how fast you return to base from your secondary lead. The Pitcher, even if he has great stuff, doesn’t mean he’s a pitcher, he may be a thrower and it’s your job to figure out which. What’s the basic difference between a pitcher and a thrower? A pitcher uses his Arm and Head while a thrower only uses his Arm. A. Does the pitcher pay close attention to base runners and keep them close. Some “throwers” seem to completely forget there’s now a runner on and immediately focuses only on the next hitter. B. What type of move does he have to first base and does he have different moves. Some pitchers will throw their C pick off move making the runner think that was his best move, then come back with his (A) move which catches the runner off base. Be sure you’ve seen his (A) move. C. How quick is his delivery to home plate? Does he always lift his leg from the stretch position to go home or does he also use a slide step? This makes a huge difference when trying to find an indicator to run on. D. Does he come set with his hands high at the chest or low down around his belt, or does he vary? Watch to see any tell tale signs of different arm angle or speed for different pitches. E. Last, but not least, does he field his position well? Does he end up in a fielding position after releasing the ball, or does he fall off the mound, which makes him vulnerable to a bunt to the opposite side. By now your head may be spinning and you’re thinking “There’s no way I can do all this, and if I do, I’ll never remember it.” Trust me, after a little practice you’ll do it unconsciously and quickly. That being said … there’s more to look at. It’s important you know the ability of the first baseman. Watch to see his ability to scoop balls out of the dirt, does he attack them, or shy backwards away from them. This could be crucial in you deciding whether to attempt advancing to third on a fielder’s low throw to first. Does he come off the bag for an off target throw or does he attempt to maintain contact with the base and stretch for the throw. Does he commit too soon what direction he stretches to and becomes inflexible? Again, these are factors which will directly affect your ability to advance from second to third or third to home. How do the middle infielders turn a double play? Do they use the same footwork no matter where the ball or the runner is at. Do they get to the base early and wait for the throw or do they attempt to time the throw and make the pivot in one smooth motion? These factors could dictate on which side of the base to slide, either to attempt to beat the throw, but mainly to break up the double play. If you know the shortstop Always crosses over second base and throws from the right field side of the bag, you’ll automatically slide towards that area in order to disrupt his relay throw. That is not dirty play or illegal … it’s good head’s up baseball, and as long as you can reach the base with your arm or leg, you can slide anywhere you want. There are of course, the general fielder evaluation you’ll quickly perform, such as does the fielder move laterally well, does he charge a slow roller, will he charge a bouncing ball or wait back for the ball? All of these very small items are important and could be the difference between you being a Good baseball player and a Hall of Fame player.